and Theory after the Death of the Subject. Champaigne, IL: Dalkey Archive Press-U of Illinois, 2007. My dissertation, completed at the Ohio State University in 2003 and subsequently revised for June 15, 2007 publication by Dalkey Archive Press, explores a topic fundamental to any literary study, the author’s relationship to her medium. The broad question I pose is simply this: What is the poet’s relationship with language? More specific questions include: What is the difference between conventional discourse and literary/poetic language? What about language itself inspires the poet to write? What happens when a poet theorizes language to be beyond her control, or even more complex, controlling her instead of the other way around? I apply these questions to a particular moment in American poetry—the late 1970s and early 1980s—a time when new theories of language and literature were spreading through the academy and the general culture alike. My method first reads a poet’s work from this period with a keen focus on what her poems both explicitly and implicitly say about language. Then, I read a theorist from the period to reconstruct his theory of language and literature. Finally, I engage the two—poet and theorist—in a dialectic that exhibits how contemporaneous theories of language affect how and what a poet writes. My introductory chapter juxtaposes traditional views of the poet’s relationship to language with poststructuralist theories of authors' roles in creating literature. The poet traditionally has been seen as a master of language who attempts to express her experience in and of the world; her primary anxiety, particularly since the Romantic movement, comes from finding the words with which to utter the sublime reality of her innermost psyche. However, in the post-Romantic world of contemporary American poetry, a world rocked by structuralist and poststructuralist theories of how discourse inscribes subjectivity, lyric feeling has been devalued as mere conventional code and the poet has in many instances been reduced to a mere function of language rather than other way around. The poet now is seen as constituted by language; and the poet’s primary anxiety now is seen as coming from sorting her real self from the various texts and discourses that formed it. The death of the poet means that, first, the poet is spoken through and through by a language that is not of her own making and, second, the poet is nothing but the coded expression of her culture. 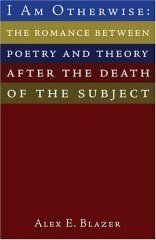 However, I propose that contemporary poets are not "dead" ciphers of conventional language; instead, they are challenged by a new Mount Blanc in the form of poststructuralist theories of language and the death of the author. For contemporary poets, the Romantic experience of looking out upon open and abyssal nature has been replaced by the experience of living in a hyper-mediating social world whose new frontier is the information age and whose sublime object is no longer outward nature but its own medium. Language is the outer limit of the social construction of reality and the inner possibility for a transcendent human subjectivity; language as convention threatens the poet with its constraints, but language as poetry invigorates the poet with its potential disruptions of the symbolic order. The poet (and by extension, writers in general) has a love/hate relationship with language. On the one hand, she detests conventional language for it is dead and deadly, a convention of culture that would subjugate her psyche to its rules; on the other, she cherishes poetic language for it is alive and animating, an imaginative bloom that would allow her psyche to burst forth and change customary habits of culture. The poet strives to assert control of her psychological constitution by transforming conventional language into literary/poetic language. The chapter introduces a continuum of American poets’ diverse psychological relationships with language, ranging from anxiety in Adrienne Rich, irony in John Ashbery, anguish in Jorie Graham, and obsession in Barrett Watten. Thereafter, I juxtapose each poet’s affect regarding language with a specific poststructuralist’s theory of language relevant to that affect—from Harold Bloom’s anxiety of influence and Paul de Man’s deconstructive rhetoric to Maurice Blanchot’s literature of silent impossibility and Jacques Lacan’s subjective destitution within the symbolic order. Chapter Two: A Rich Inflammation or a Dead Bloom? Chapter Two explores the first reaction to the realization that one is constituted through and through by language: anxiety. The poetry of Adrienne Rich represents a desire by the marginalized for power to speak out against the language of those in power. The poetic theory of Harold Bloom, specifically the anxiety of influence, asserts that poets defend themselves against their literary precursors in order to write. First, I transform Bloom’s theory of poetic influence into a theory of language influence, and then I argue that Rich’s anxiety of being infected by a patriarchal discourse that would suffocate feminine sexuality, creativity, and speech compels her to break free from the codes and construct a disruptive poetic that would stand over against conventional, patriarchal contamination and containment. Chapter Three analyzes a second response to language: irony. The poetry of John Ashbery turns discourse against itself in order to subvert conventional norms of subjectivity, much like Paul de Man’s deconstruction of the rhetoric of literature. Whereas Bloom cites a poetry inspired by the anxiety of prior language, de Man envisions a poetry of irony, a reveling in the limitless possibilities that the deconstruction of tropes affords. Applying a critical reading of de Man to a critical reading of Ashbery, I suggest that Ashbery ironizes himself out of the conventional narrative "I" of lyric poetry by self-consciously play with language. This constitutes the poet’s attempt to get underneath the linguistic skin of his always already mediated subjectivity and grasp the ungraspable: the psychic reality that exists beneath or outside language. Chapter Four appraises the work of Jorie Graham, whose poetry is one of anguish. Her poetics hollow out conventional language and gesture toward a void at the heart of the symbolic. Her poetry, like Maurice Blanchot’s theory, is a literature of impossibility that seeks to first excavate and then negate the influential voices of other languages in order to create a poetic language wholly one’s own, founded in nothing. Her task is paradoxical and contraventional because it seeks to speak the hole, the place shed of language. Whereas Rich is full of anxious being and Ashbery replete with ironized meaning, Graham is emptied of symbolic subjectivity. The poet uses poststructuralist theory to strip the psyche bare; and in the process of anguished self-nullification, the psyche traverses a real of being that resists symbolic overtures. Chapter Five investigates a final poetic reaction to having one’s subjectivity constituted by another’s language: obsession. Barrett Watten conceives of language as an infernal machine, an impersonal script-writer which dictates the codes of existence and inscribes subjectivity from the outside. This realization prompts him to ask the obsessional’s prime question, according to the psychoanalyst Jacques Lacan: To be or not to be? Am I dead or alive? However, Watten’s poetry seeks to forestall the answer by throwing a wrench into the discursive work: "I am otherwise." By generating nonsensical, opaque texts that foreground language as pure and material textuality, devoid of meaning, the poet delays the inevitable closure of the text, the interpretation of the poem, the shutdown of his psyche. He is compelled to become the writing machine that he detests, but with this subversion: he exists as the breakdown of language, the disassemblage of the symbolic order theorized by Lacan; and he yields a state of subjective destitution, conceptualized by Lacan as the end of psychoanalysis and the end of subjectivity, as he drives his poems toward the real of the psyche. My concluding chapter explores the relationship between the rise of theory and theoretically self-conscious poetry from the 1970s and early 1980s. In answering the question of what little remains of romanticism in the postmodern era, it theorizes a space for a postromantic poetry at the lack or limit of theory. One of the results of my study finds that the new poetry is taxed with the effort to first clear the saturation of language and other symbolic mediations, including theory, and then construct an authorial and writerly subjectivity that exists with a knowledge of linguistic theory, yet can maneuver itself outside the realm of language and theory both. This is no small undertaking. My study nevertheless suggests that whereas earlier poets tarried with philosophy or criticism, poets of this time period unite lyric feeling and linguistic/literary theory.